Enveloped, brick-shaped or ovoid virion, 220-450nm long and 140-260nm wide. The surface membrane displays surface tubules or surface filaments. Two distinct infectious virus particles exists: the intracellular mature virus (IMV) and the extracellular enveloped virus (EEV). Linear, dsDNA genome of 130-375kb. The linear genome is flanked by inverted terminal repeat (ITR) sequences which are covalently-closed at their extremities. Attachment of the viral proteins to host glycosaminoglycans (GAGs) mediates endocytosis of the virus into the host cell. Fusion with the plasma membrane to release the core into the host cytoplasm. Early phase: early genes are transcribed in the cytoplasm by viral RNA polymerase. Early expression begins at 30 minutes post-infection. Core is completely uncoated as early expression ends, viral genome is now free in the cytoplasm. Intermediate phase: Intermediate genes are expressed, triggering genomic DNA replication at approximately 100 minutes post-infection. Late phase: Late genes are expressed from 140 min to 48 hours post-infection, producing all structural proteins. Assembly of progeny virions starts in cytoplasmic viral factories, producing an spherical immature particle. 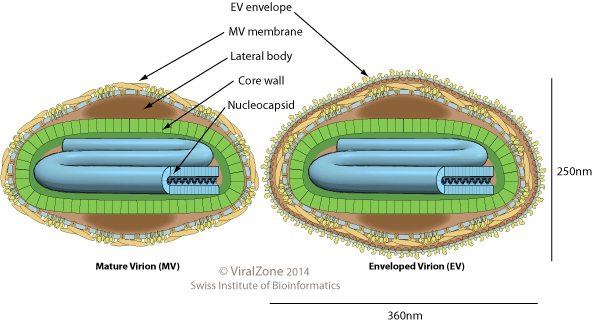 This virus particle matures into brick-shaped intracellular mature virion (IMV). IMV virion can be released upon cell lysis, or can acquire a second double membrane from trans-Golgi and bud as external enveloped virion (EEV). Pox from english pock, ‘pustule’, referring to skin lesions. TRANSMISSION Direct contact or fomites. The vaccinia virus A35R localizes to host endosomes and inhibits MHC class II antigen presentation . Additionally, the poxviral E3 ubiquitin-protein ligase LAP promotes ubiquitination and subsequent degradation of host MHC-I and CD4 molecules . Several poxviral proteins are dedicated to the inhibition of host apoptosis. For example Myxoma virus M11L alters the pathway by preventing the conformational activation of host Bax at the mitochondria . Vaccinia F1L functions both as a suppressor of proapoptotic Bcl-2 family of proteins and as an inhibitor of caspase-9 . Molluscipoxviruses encode a viral FLICE-inhibitory protein (v-FLIP) that prevents apoptosis induced by death receptors . FPV039 inhibits apoptosis by sequestering and inactivating multiple proapoptotic Bcl-2 proteins, including Bak and Bax . Vaccinia virus actively disrupts the cellular autophagy through a mechanism that involves aberrant LC3 lipidation and a direct conjugation between ATG12 and ATG3 . The myxomavirus Ankyrin repeat domain-containing protein M-T5 is an adapter of SKP1-containing E3 ubiquitin-protein ligases which mediate the ubiquitination and subsequent proteasomal degradation of host target proteins including CDKN1B. Disappearance of host CDKN1B correlates with cell cycle progression through the G0/G1 checkpoint . The B14 protein from vaccinia virus functions by binding to the IKK complex via an interaction with IKK-beta and preventing the phosphorylation of IKK-beta on its activation loop. In turn, IKK-beta is not activated and fails to phosphorylate IkB-beta, leaving IkB-beta able to retain NF-kappa-B in the cytoplasm . MC159 protein from the molluscum contagiosum instead inhibits NF-kappa-B activation by interacting with the IkB kinase complex . Poxviruses inhibit the cascade leading to production of interferon-beta by mainly targeting the host IRF3 protein. For instance, vaccinia virus protein C6 inhibits IRF3 activation downstream of TBK1 .